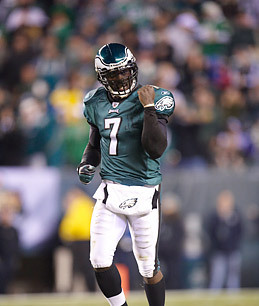 What was your Michael Vick experience this year? Did you get increasingly giddy as the Philadelphia Eagles quarterback — and convicted felon — mounted his remarkable comeback? Did your jaw drop right into the pretzel bowl as he broke records against the Washington Redskins on Monday Night Football or when he beat the New York Giants almost single-handedly? If so, did you then feel guilty about lauding a man who'd systematically tortured and murdered dogs — a man who had dispensed so much cruelty? But, then, did the guilt pass quickly because, well — did you just see that play? Or were you disgusted, disappointed that the nation would celebrate such a person just because he throws an oblong ball better than most people alive? Or did you maybe swell with pride, assured that cosmic justice was being done, because you'd always thought the demonization of Vick reeked of racism and double standards? Although fans are excitedly awaiting the Feb. 6 Super Bowl between the Pittsburgh Steelers and the Green Bay Packers, Vick's epic second act was the most electrifying story line of the 2010 NFL season. It was also the most polarizing. Does Vick's story really say something about redemption, one of the more hackneyed concepts in American society? Does he expose the hypocrisy of an American culture that is sanctimonious about private indiscretions but then forgiving of a public winner? Or has Vick's case always been an overblown media scandal that lays uncomfortably bare our national original sin: a deeply ingrained hostility towards the black man? How you feel about Michael Vick might say less about him and more about you. Vick has behaved admirably since his release from prison in July 2009. He volunteers his time to warn others against repeating his mistakes. On the field, though he threw an ill-advised interception at the end of Philadelphia's Jan. 9 playoff loss to the Packers, his season-long performance was, by all objective measures, stunning. He's gone from prison to the Pro Bowl, which will be played Jan. 30 in Honolulu. His future employment, whether with the Eagles or another team willing to break the bank to sign him, will be a topic of off-season obsession. Vick is back atop America's most popular, most lucrative spectator sport, a $9 billion business that has roared through the recession. No matter how he jumbles your emotions, his campaign is a comeback tale unmatched in American public life. I'm all about redemption. He's a better player and a better person. He's admitted that his time in prison was the best thing for him. I hope he stays on the straight and narrow and continues to have success on and off the field.